Art that inspires others to live their dreams and fill their lives with hope and color. 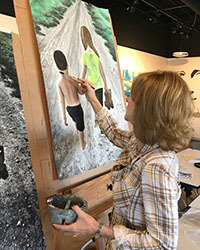 Kay followed the unconventional route back to her passion for painting... her artistic talent was discovered in elementary school art classes, so her mom enrolled her in private oil painting lessons around the age of 10. She continued to develop her skills through her senior year in high school where she was also introduced to acrylics, pastel and WATERCOLOR! Wow, the magic of watercolor. 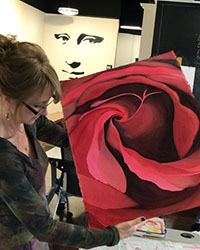 Kay fell in love with the medium—it’s rich color, intensity, and ability to move and create it’s own magic. As she went off to college she decided to pursue a Master’s Degree in Education as her means to “earn a living,” earning both her Bachelor’s and Master’s degrees as a Meadows Scholar at UNT in North Texas in 1988. Since she did not want to use her love for art as a way to make a full-time salary, she put away her paint brushes for 30 years, only producing 5 works of art during that long time span. Kay started her own highly successful personal training and life coaching business in 1988. She published over 60 articles in peer-reviewed journals, spoke at national conferences and was quoted in dozens of leading newspapers and magazines. Kay retired that business in 2016. Thus, in April 2016 she started back in art classes and rediscovered that incredible passion she had for creating beautiful art. For her it was like finding her spirit once again. In Kay’s paintings you see rich, vivid, dramatic color and a depth that is often unseen in watercolor. She paints what inspires her instead of locking herself into a niche. Her paintings have that WOW factor. She is a dreamer that logs her dreams, listens to her spirit and seeks to live a life that is beautiful, giving, teaching and filled with adventure. Faith, family, friends, fitness and fine art…they are her inspiration. Kay’s goal in sharing her art is to inspire others to live their dreams and fill their lives with hope and color.